They’ve been serving delicious Jordanian food since 1952. Hashem Restaurant, located in downtown Amman, is one of the most well known of all local food restaurants in the city. 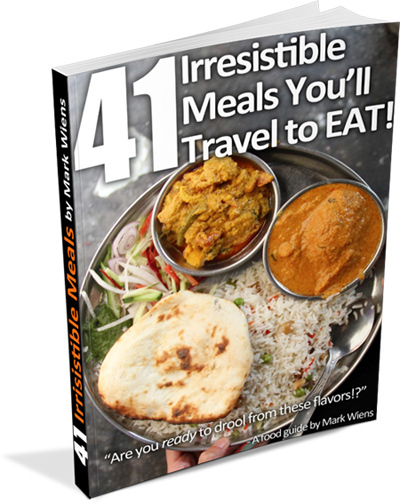 In this post I’ll share with you my experience enjoying a meal at this legendary street food restaurant. 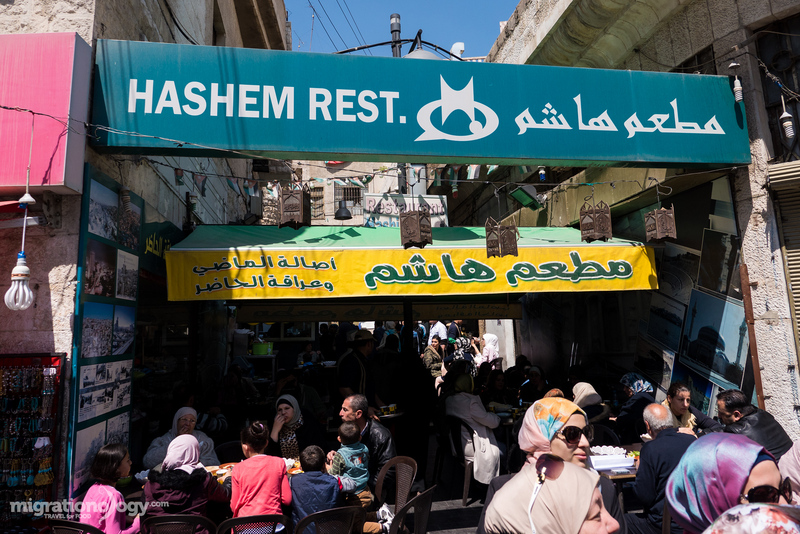 The food at Hashem Restaurant is actually prepared indoors and they have indoor seating as well, but because most of the seating is open air, along the sidewalk and sandwiched between two downtown buildings in Amman, I’d classify it as street food. There’s no menu at Hashem Restaurant, but they serve a basic set of dishes that never changes. After you find a table, you’ll immediately, or at least pretty quickly depending on how busy they are, be delivered a plate of vegetables – onions, tomatoes, and mint. And you’ll also get a paper topped with bread. 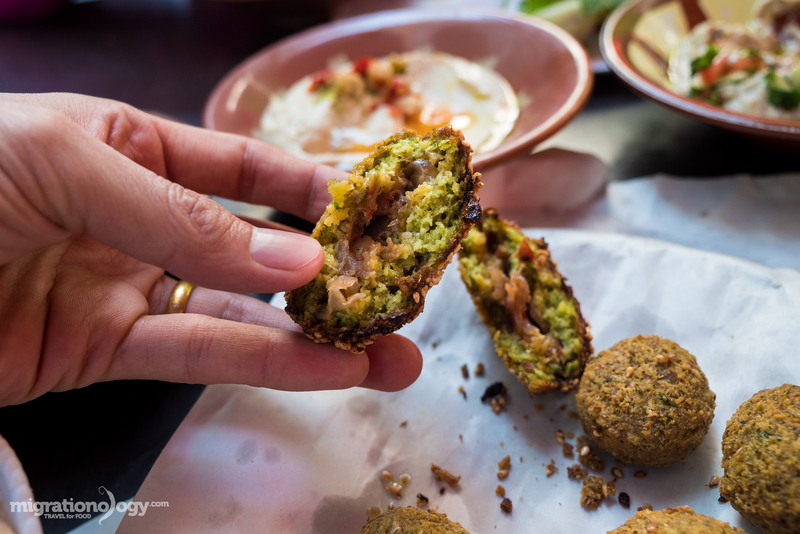 You can then choose your main dishes, falafel is a must – and the owner even claims falafel was invented in Jordan (I’m honestly not really sure where falafel was invented, but I can say I had the best falafel in Jordan of anywhere). They also have moutabel, ful medames, hummus, and fattet hummus and probably a few other dishes I missed. Also, it’s a vegetarian restaurant. 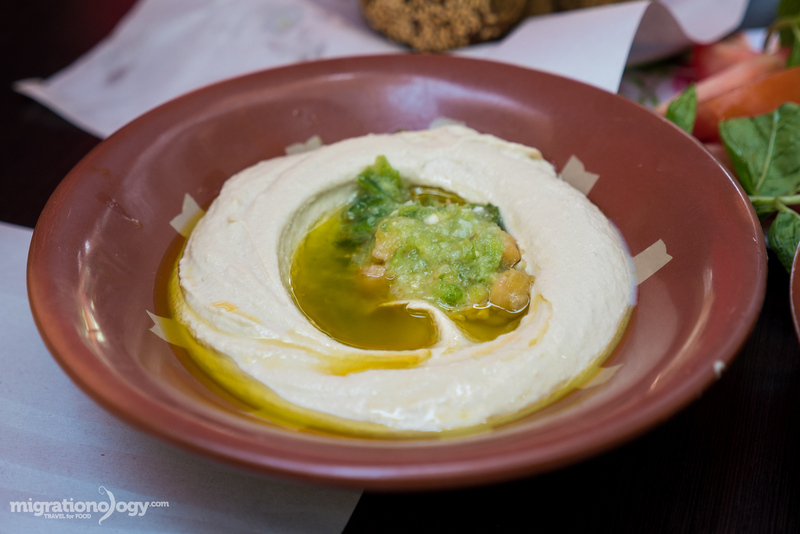 It would be nearly impossible to go to Hashem Restaurant without ordering hummus, not only because it’s a standard dish they serve, but also because they make it so well. The hummus was smooth and creamy, and although it was doused in olive oil, it didn’t feel too oily or greasy. What I really liked was that extra scoop of green chili sauce on top, which elevated the taste of the hummus and gave it a noticeable lemon juice freshness. There are no utensils served at Hashem, although I ended up asking for a spoon to scoop everything out, but instead you break off little pieces of bread to scoop up all the different dips. The sibling to hummus is moutabel, and it’s one of my personal favorite dips of them all. The moutabel at Hashem included roasted eggplant, pureed into a paste, along with yoghurt, and a hint of lemon juice, drizzled with olive oil, and topped with a spoon of Arabic salad. It was rich and fluffy, with a lovely garlicky taste. Alternating between bites of hummus and moutabel was delicious. There was also a big bowl of red chili sauce on our table, and being addicted to chili, I was happy to see it. 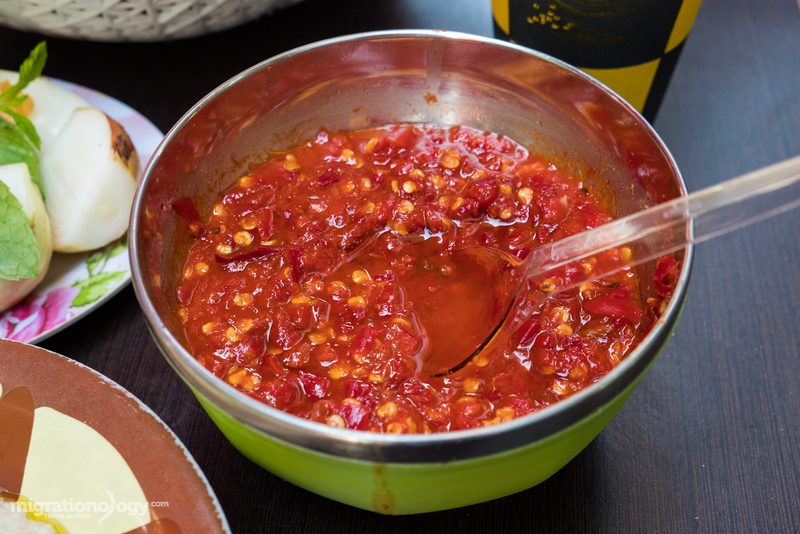 However, the chili sauce was very salty (as were other versions of this same chili sauce I tried throughout Jordan), so I couldn’t really add enough chili sauce to be spicy, yet without being overly salty. So just use the chili sauce sparingly, or your food will end up being really salty. That being said, it went very good with the hummus and especially the falafel. 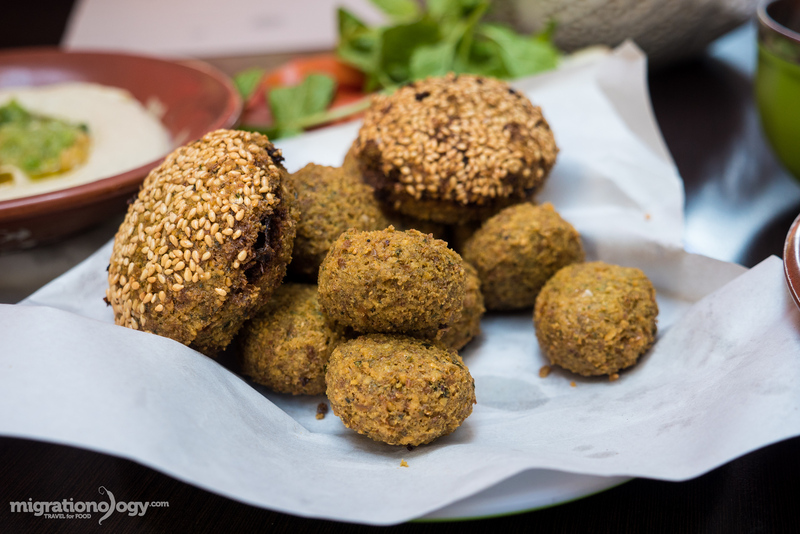 Probably the dish that’s most well known at Hashem Restaurant is their falafel, said to be some of the finest in all of Amman, and home of the original Jordanian stuffed falafel. The falafel was fried fresh, and delivered on a piece of paper. The normal single little bite sized falafels were delicious, crunchy on the outside and slightly fluffy from the chickpeas and spice mixture. But the true falafel gem at Hashem was the stuffed falafel, which were about the size of a hockey puck, and stuffed with a combination of onions and sumac, and to make things better – topped with a cap of sesame seeds. 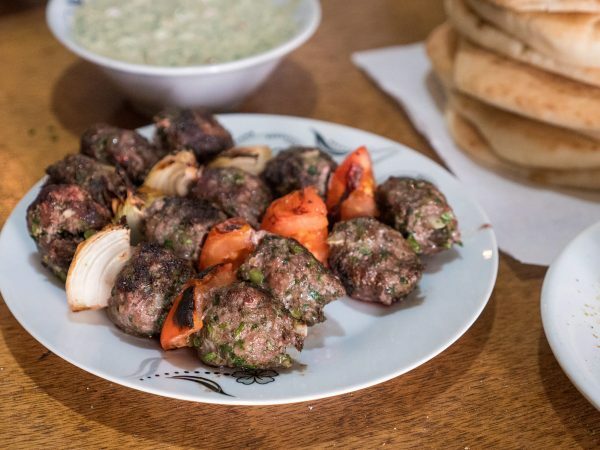 The extra onions and sumac stuffed inside, which were naturally sweet and fall apart silky after being cooked, added an extra dimension of flavor to the falafel. I’m not sure if there’s a way to glorify the looks of mushed fava beans drenched in olive oil – it’s not the prettiest food to look at. But it makes up for its looks in flavor and protein. 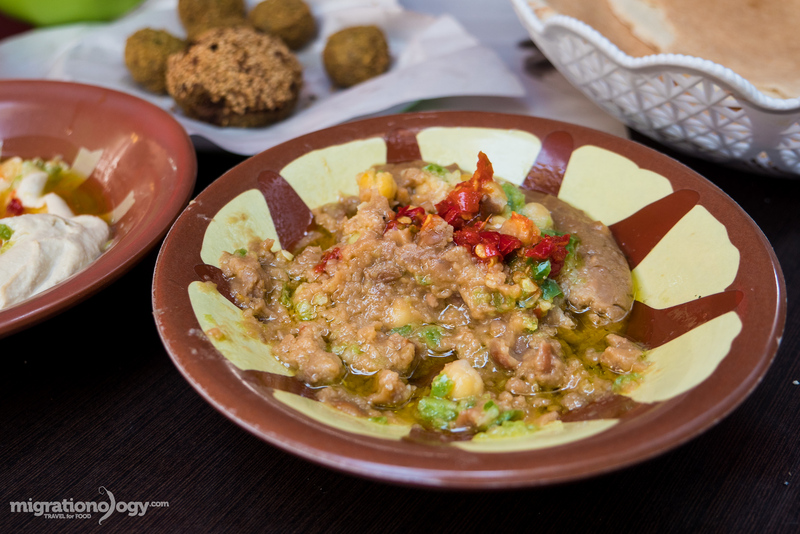 Ful medames is another dish you can order at Hashem, and myself being a huge fan of the dish ever since traveling to Egypt a few years previously, couldn’t resist. The ful at Hashem was overall pretty good, quite a smooth blend, with lemon juice and plenty of olive oil. Pretty much unchanged since 1952, Hashem Restaurant is one of the most legendary places to eat in all of Amman. People come to eat their incredible falafel and hummus, and a mix of other classic dishes. 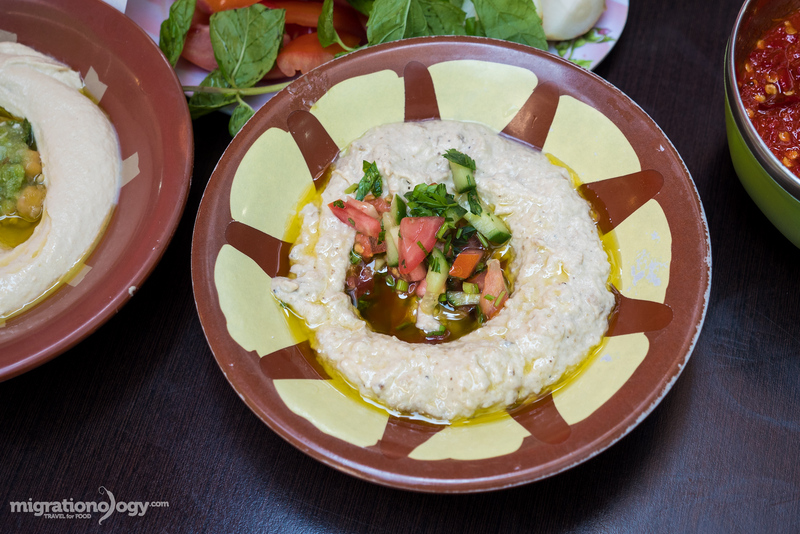 Along with serving excellent Jordanian food, Hashem Restaurant also is about enjoying the local atmosphere. It’s busy and hectic, and it can be a little confusing to figure out how to order (if you don’t speak Arabic), but that’s part of the character of the environment that makes it so fascinating. 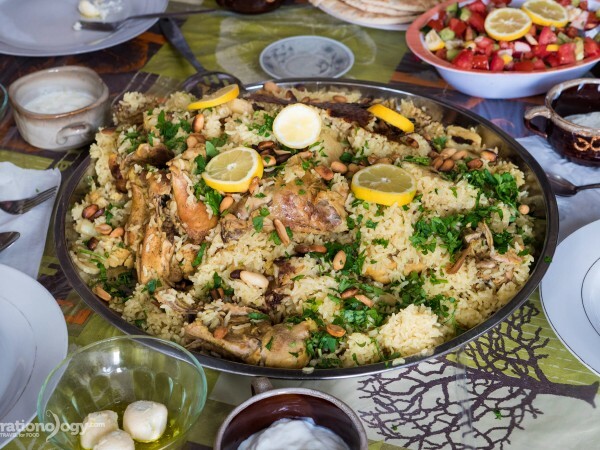 When you’re in Amman, don’t miss a Jordanian street food meal at the legendary Hashem Restaurant. Prices: We ordered a lot of food, and our total bill for everything – moutabel (2 plates), hummus, ful medames, falafel, and teas, came to 7 JD. How to get there: The restaurant is located right in the heart of downtown Amman just off Shaaban Street. If you ask any local, they will point you in the right direction. 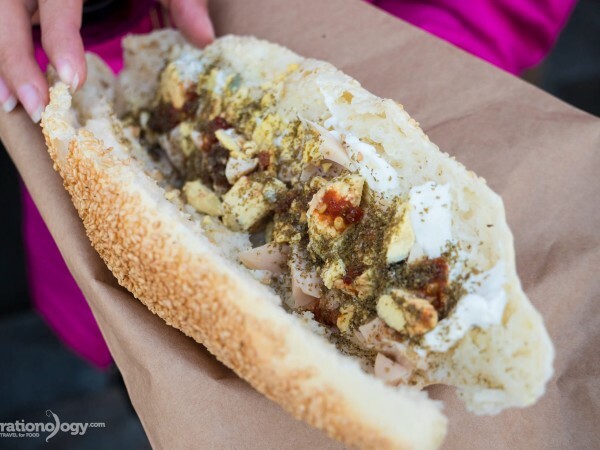 Now I’m craving falafel and hummus- Amman street food looks yummy. I am there right now??? ?I am gonna try the mutabel ???????????????? Thank god there is someone like you who rates and talks about street food. Some of the best food in the world we have known is the street food. I can’t wait to go and try some of these things. Thanks for posting and hopefully I will see more street food posts in the future! Wow, the dishes are gorgeous, should be a delight. This really takes me back, Mark! I was here about 6 months ago and couldn’t get enough of their falafel and hummus. I ate their at least once every day I was in town. I hope you made it out to the Roman ruins of Jerash, they were incredible! Hey Cameron, awesome to hear that. This is such a great restaurant! Hashem is great! I loved especially the stuffed falafel. Seeing you eating it, I could almost taste it again. So – thanks for the nice video! And besides- Jordan is a wonderful country. Anybody should have seen Petra and the dead sea once. Street foods, for me, is always one of the best ways to eat when traveling to a new place. It has the most authentic flavoring and it feels as if you are experiencing the day to day life of the locals. I really liked you series on Jordan foods because it’s a type of food I don’t usually experience here in the states. Hi Megan, great to hear from you, I agree with you about street food. Thank you very much, appreciate it! Hi, Mark! The restaurant seems to be very interesting place, with vibrant atmosphere! Such a great food, I loved mostly the stuffed falafel and the hummus must be fantastic! My eye was caught also by these green almonds U purchased later… I have never tried this, but I know a lot about green almonds – these are popular also in persian cuisine. Althoug is not very easy to reach it due to very short season. Loved your Jordan food series! Thank you very much Chris. Hope you can eat at Hashem soon!